Image taken from Jeff Weber's t-shirt today! Talk the talk, walk the walk, and wear the schwag! As I begin my third week at Unidata, I thought I would take a moment to reflect on my experience. It would be quite a task to try to summarize my experience in one post, so I’ll start off simply reflecting on the phrase “community driven”, as it’s a phrase I’ve heard for years but never fully appreciated. 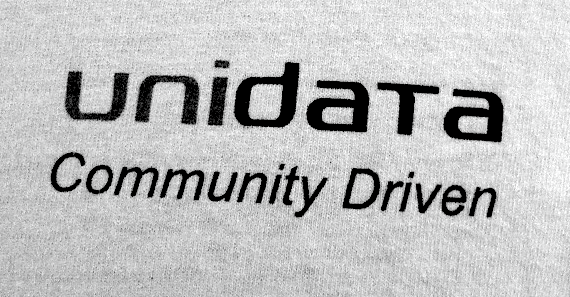 “Community driven” was a phrase I heard tossed around several times during my stint on the Unidata Users Committee as the student representative, but it is hard to actually grasp what that means until you’ve been put into a position to see colleagues put that phrase into action. Sure, Unidata has Policy and Users committees, so they must care about what the community thinks, right? Right?!? I mean, I was there – I felt like they cared what the Users Committee thought while we were there, in town, in person. During the Users Committee meetings, we would bring up issues and needs that we, or others in the community, felt needed to be addressed. Six months later we would return to find that those concerns were not just being listened to, but being acted upon. But what was going on behind the scenes during those six months? Did the staff address our concerns in the one week following the meeting, only to forget about the community until our next Users Committee meeting six months later? I never really thought this was the case, but the cynical side of me (thanks, grad school!) is always drawn to this possibility (with any organization claiming to be community oriented, not just Undiata). Well, now that I’ve toured backstage area of Foothills Lab 4, I have an idea of what happens during those periods. Observation 1: One of my first tasks as Unidata as a Software Engineer has been to dig into support. While I always heard that support was a big deal within Unidata, now that I am ‘on the other side’, so to say, I have to agree that not only is support a big deal, it’s an unbelievably huge deal! It’s clear that addressing community needs is not something that happens only a few times a year during the governing committee meetings and then gets put on the back burner, but it’s a DAILY thing. Quite honestly, I think it’s fun (yeah, I’ve logged into support at home during the weekends – it’s kind of addicting...I may need a support group in a few months). I’ve had the opportunity to answer questions regarding the specifics of operating systems I’ve never used and compilers I’ve never touched. While Google has been my friend, a even bigger help has been looking at the wealth contained within previous support questions and answers (these are indexed by Google, BTW, and are available to all). The support tickets I’ve reviewed show that the Unidata staff puts quite a bit of thought and time into fully answering the issues submitted to support. On one hand, the detailed replies make support easier for us in the future (especially since those replies show up on through internet searches), but it also helps educate the users. On the other hand, however, it sets the bar high – a bar that I can only hope to meet! Observation 2: Another task I’ve been assigned is to go through the workshop / online training materials to look for areas where steps that are obvious to the developers do not quite translate to the end users. It was always annoying in school to hear a prof say “it’s obvious that...”, and even more annoying to read it in a book (at least I could question the prof in class!). What was even more annoying, and infuriating, is when steps were skipped and it was never even hinted that they were skipped (at least the ‘it’s obvious’ statement would clue us students into the fact that a leap of faith had occurred). Ok, so how does this relate to the concept of community driven / community oriented? Well, I could have been told to go through these materials on my own time at home, as it’s part of my job to know this stuff (and not my job to learn the basics at work). I could have been told that users who don’t understand basic computing should not being using our packages. I could have been told those things. Instead, it was clear that if the community cannot use our packages due to ‘leaps of faith’ in the documentation, then what is the point? If we aren’t serving our community in every area (support, documentation, and software), then we might as well pack-up and go home. So, let’s take the time to allow someone who knows a bit about computing and a bit about meteorology (as well as someone who grasps, at some level, the general computing abilities of those in an academic setting) to take a look at our training material in hopes that these documents can be further clarified! An added bonus for me – I may get to help out during the training workshops! I always enjoyed teaching, so this will be an opportunity to get back into a classroom-like setting. Observation 3: I’ve had the chance to sit through a few staff meetings so far, and I’ve been impressed at the number of times I’ve heard “what does the community think?” or "this brought up at a Users or Policy committee meeting.”. I could play devil's advocate and say “well, strategic planning for the next proposal is spinning up, so maybe that is why there is so much focus on the community”, but the feel of these conversations has been very much “business as usual”. Bottom line – these folks care about your thoughts, needs, concerns, etc.! Contact those awesome individuals serving on our governing committees (maybe even consider serving!) (https://www.unidata.ucar.edu/community/index.html#governance)! Subscribe to our “News from Unidata” blog (https://www.unidata.ucar.edu/blogs/news/feed/entries/atom) or the “Developer’s Blog” (https://www.unidata.ucar.edu/blogs/developer/) (both are open for comments, and comments - we love em’). Subscribe to our users mailing lists and participate (https://www.unidata.ucar.edu/support/#mailinglists)! If you’re in Boulder for a workshop or meeting, come say hello (https://www.unidata.ucar.edu/about/index.html#visit)! Visit us at the Fall AGU or Annual AMS meetings (https://www.unidata.ucar.edu/events/index.html#conferences). Consider attending a training workshop (https://www.unidata.ucar.edu/events/2011TrainingWorkshop/). Consider attending the 2012 Triennial Workshop (organized by the Users Committee and Unidata!). More details to come, but see: https://www.unidata.ucar.edu/events/index.html#triennial. Which of these do you use? Which are most appealing to you? What can we do to better keep those lines of communication open?